Statues of a Buddhist divinity are dressed up to ease the journey into the afterlife. In many Japanese cemeteries, including the vast Okunoin–the country’s largest, located south of Osaka, there are statues of varying sizes that stand out for their bright red bibs and little knit caps. Mixed in with the grey tombstones and domed stupas, some of these figures even have cheerfully made-up faces, pink with rouge and smeared with lipstick. These playful and poignant icons are Jizos, or Jizo Bosatsu, named for a Bodhisattva divinity of Buddhism that has been part of Japanese culture for centuries. As with many divinities in Asian pantheons, Jizo Bosatsu is a multi-tasker: The figure can be a he or a she, and is a guardian of both travelers and lost souls. But it is the role as protector of children—especially unborn children or those who have died at a young age—that accounts for the spirited dress, a modern adaptation of Jizo that is unique to Japanese Buddhism. Cemetery visitors bedeck the figures at Okunoin with offerings, as do the monks who are charged with tending the graveyard. But the most poignant gifts and adornments come from parents, either in mourning for the loss of a child or in thanks for a young one saved. 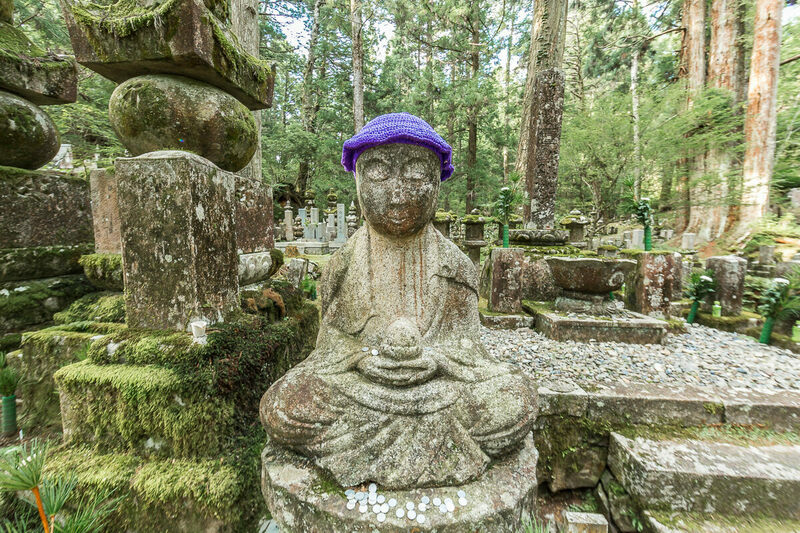 Caps and scarves are added to protect the divinity from the elements, and bibs, in turn, to symbolize Jizo’s protection of children. Rouge and lipstick are not uncommon to find on Jizo statues. The story of Jizo originates from the 14th-century tale of the Sai no Kawara (“riverbed of the netherworld”), a place much like the River Styx in Greek mythology, or even purgatory in the Christian tradition. According to legend, children who are miscarried, stillborn, or die before their parents enter a limbo, or kind of hell, at the banks of a rocky river. Here they are forced to build towers from stones to atone for the sin of causing such grief, and to help add to their parents’ merit in the afterlife. Demons then turn up every night and destroy the towers, forcing the children to constantly rebuild. Jizo is the one Bosatsu who turned down enlightenment in order to provide an escape from this Sisyphean task, by hiding children in his robe sleeves and taking them to the Buddhist equivalent of heaven, a duty he has promised to fulfill endlessly. A common sight in cemeteries throughout Japan, a string of red-bibbed Jizos. Although many hues are found in the Jizos’ adornments, the most common shade is red, the color in Japanese mythological tradition that is often traced back to the ancient practice of repelling demons, themselves often colored in shades of bright ruby or vermilion. Over time, red has come to represent both death and life, as seen in Japanese symbols from the torii gates of Shinto shrines to the Rising Sun of the national flag. A more contemporary adaptation of the Jizo has emerged, as the figure has come to preside over the Mizuko-Kuya, or fetus memorial service, as a way to ritualize the grief of miscarriage, abortion, or still birth. The performance of these ceremonies has expanded in recent years, seen as a way to ease parents’ pain and mourn this singular loss. It is done throughout Japan, and has been reaching into the West as well, as the traditions of Japanese Buddhism have spread. A contemporary version of Jizo Bosatsu, Mizuko Jizo (or “water child”), a statuary reinterpretation with children and babies surrounding and often clutching at the divinity. At the back of the burial grounds, nearly slipping into the forest, there is a large pyramid entirely made up of small, child-like Jizo statues. It is a muen-zuka, or “Mound of the Nameless,” a piling for spirits who have no family or anyone to individually care for their graves. The structure isn’t that old—only 30 or 40 years, according the monks who tend the cemetery—but with the bottom rows dressed, and bibs slowly creeping up the sides over time, it is a visually powerful way to remember and honor those lost, and otherwise forgotten. A Muen-zuka, shaped as a large pyramid of small Jizos. The offerings of clothes and tokens serve as way for parents to honor the memory of the children they’ve lost. A female Mizuka Jizo, with an infant in arms and a child clutching at the robe. Photos of Hong Kong's intriguing cemeteries, where even the gravestones are high-rises.